Examples, solutions, and videos to teach Grade 3 students how to find the volume of cubes. 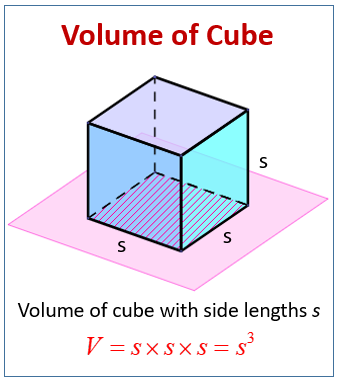 Volume of cube = s3, where s is the length of the side. The following diagram shows the formula to find the volume of a cube.Scroll down the page for more examples and solutions. Volume of a cube explained. The volume of a cube is found by multiplying base area by the height or one side cubed. How to calculate the Volume of a cube.